The addition to the Early Childhood Center includes three new preschool classrooms along with a multipurpose area. After reconfiguration and renovation of 17 existing classrooms, the ECC now has 21 classrooms and six small one-on-one classrooms suited for individual student needs. Each classroom contains built-in casework for storage and a classroom sink. Administrative offices are relocated closer to the main entrance for easier parent and student access and for added safety. The casework was designed as a colorful “skyline” silhouette. Lower cabinets on shelves are for children to easily access supplies and learn how to put them away when finished. 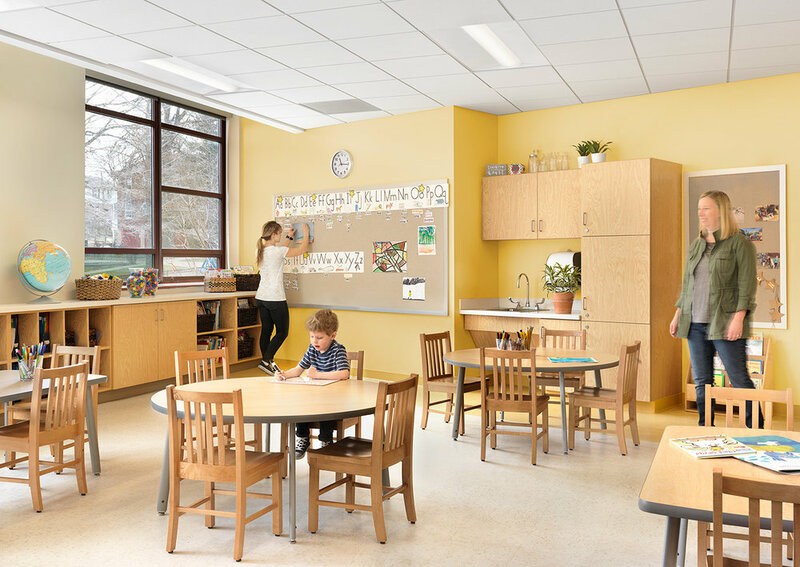 Colorful soffits and matching floor tiles serve as easy wayfinding elements for young children.